With its all-star cast and award friendly story, The Butler is shaping up to be one of the biggest films of the summer. The film, which stars such household names as Forest Whitaker, Oprah Winfrey, John Cusack, and Robin Williams, will also have a Biolan in the credits: co-producer David Jacobson (’08). The movie, which hits theatres Aug. 16, became a passion project for the Cinema and Media Arts graduate when producer Laura Ziskin (The Amazing Spider-Man, Dinner with Friends, Pretty Woman), who developed the project, passed away in June 2011. Jacobson continued on the project as a co-producer, working to finish the film in her honor. Here, Jacobson tells Biola what it was like working on The Butler, which traces the true story of Cecil Gaines, a butler in the White House from 1952 to 1986, inspired by the real-life figure, Eugene Allen. What was your journey to becoming a co-producer on The Butler? I was incredibly blessed to have a very close relationship and mentorship with Laura Ziskin. She had optioned the underlying Washington Post article in 2008 and hired Danny Strong to write the script. I was involved very early on when the project was set up at Columbia Pictures. After she passed away and her producing partner, Pam Williams, decided to continue to move the film forward independently, I wanted to remain committed to the project and go through the trial-by-fire process of leaving the studio bubble and producing our first independent film. It was the most challenging thing I have ever done, but it was a deeply personal commitment for both of us. I could not be more proud of what we accomplished for Laura. What was it like to continue this film with Laura gone? This really was the culmination of my time learning and growing under Laura. To be able to realize her last vision and to work alongside her old partner was something that I felt would be a huge missed opportunity if I didn’t do it — something that I would regret — and many of my peers thought I was crazy for not taking another studio job right after she passed away. So for me, this was a passion project in the truest sense. I wanted to make her proud and I wanted to prove to myself that I could roll up my sleeves and learn this independent business on a limited scale that had massive ambition to it. The project itself was an unbelievably tough one to tackle, but that type of thing never caused Laura or those close to her to shy away from challenges. Have you always imagined working on major films like The Butler? Well, to me, The Butler is large in stature and ambition but relatively small in budget and resources. The first feature film project I worked on was The Amazing Spider-Man, directed by Marc Webb. I was an assistant to Laura on that film and thought that I would definitely remain working in the studio space on huge movies like that for a long time. While it was an incredible experience, I was intimately exposed to how involved and gigantic of a process overseeing a $200 million-plus movie can be. But it is an entirely different piece of business than a film like The Butler, which is certainly no less involving or challenging, but the scale of things is very different and the resources couldn’t be more different. I hope to keep making films at all budget ranges, but for the immediate future I am targeting projects under $30 million or so that I can get financed and sell to a studio. Describe what a day on set was like. Every day was different, as you can imagine. We shot all over the state of Louisiana and were hit with hurricanes in both production and post-production. Each day would involve constant interaction with our production departments and crew to ensure things were on track for that day’s shoot. A lot of my time would also be spent working on the never-ending deal process for our complex financing structure and keeping our partners and investors informed and taken care of when they were able to be with us on set. I would also find a little time to make sure our director had great music to play on set in between set-ups. Our film is a period piece that travels through several decades so we thought it would be fun and important to set the tone with great period music cues. Do you have any favorite moments or anecdotes from filming? There are literally too many to count. I had never spent time in the South before and the experience I had living in Louisiana for several months was really eye-opening for me. One of the most fun nights was when we shot the Freedom Ride sequence on an old bridge in a very rural Southern town. It was a night shoot with the moon and smoke reflecting off the water and hundreds of extras rioting around a vintage bus full of our actors. It felt real. And the locals who lived there found it eerily close to what they had lived through themselves. Are there any interactions with the actors that you’ll never forget? We had so many incredible actors and actresses on set each day that I know I’ll never forget some of the moments that our director, Lee Daniels, was able to get out of them each day. One of the most special moments, perhaps, was when Charles Allen, the real-life butler’s son, visited set from Washington, D.C. He, Forest Whitaker and I spent time talking about how much this film meant to him and his family and how picture-perfect Forest’s interpretation of his father was. It was really cool to see the entire process come full circle. How did your time at Biola influence your career? My time at Biola gave me the opportunity to discover what I really liked to do. Film school is certainly not necessary to be successful in the entertainment business, but being in a community of creative people who are focused on achieving great things in the film industry absolutely helps you focus early on with what you want to do and how to get there. We had some really talented filmmakers like Gabe Renfro, Andrew Fisher, Joel Nassan, Josh Sikora and others while I was at school — each of whom I believe will be household names someday, at least Brentwood or Beverly Hills households! Being around those guys helped motivate me to become the best young producer I could be and put myself in the best position possible to be successful early on and help guys like that get their projects made on a broader platform. I am working on a hip-hop and break dance-themed documentary called Shake the Dust with alumnus Adam Sjoberg ('07), developing and packaging another two films to bring back down to Louisiana and working on an overall capital raise and slate financing deal for a production company called Weapons of Mass Entertainment, which is led by the brilliant musician, producer and creative force, Dave Stewart. Dave and I are up to some interesting things and will hopefully be making some noise after we get through the first round of financing by the year’s end. 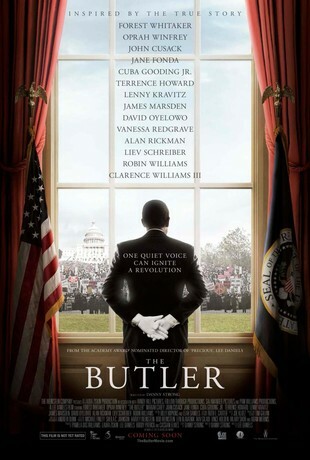 The Butler will release nationwide Aug. 16, 2013. Written by Jenna Bartlo, Media Relations Specialist. Contact Jenna for more information at 562.777.4061 or jenna.l.bartlo@biola.edu. Great article. I am really looking forward to the movie coming out. David's enthusiasm for this project is contagious. Love all of the actors in it also. This is such a great story. I had already heard of this movie and was planning on seeing it. Getting to read some of its backstory and hearing that a Biola grad was involved is so cool! Every time I saw the trailer in movie theaters, I knew this was something special. What an incredible true story it is that we will all get to watch unfold. And "HOLLLLLAAAAA!!" to David Jacobson & Biola!! Looking forward to his future projects as well! I heard Oprah mention the movie and was very interested. Now that a Biolan is on the crew, I will for sure! My son is in film at Biola as a junior. Former Attorney General Edwin Meese III says the portrayal of former President Ronald Reagan and his wife Nancy as racially insensitive in the new movie "Lee Daniels' The Butler" is not accurate. Meese has joined with other supporters of Reagan who have been angered with the film's claim that Reagan was indifferent to South Africa's apartheid and the producer's decision to have liberal Jane Fonda offer an unflattering portrayal of Nancy Reagan. "Ronald Reagan did not have a racially discriminatory bone in his body from his very youngest days," Meese told Newsmax. "He was opposed to any type of discrimination or mistreatment of anyone on the basis of race, or quite frankly any other innate characteristic." Having worked in Hollywood for 32 years, I am thrilled to have other Christians and Biolans specifically, adding "salt and light." I am a wee tad perplexed, however, by the endorsement of a movie that www.movieguide.org describes as being "well acted, with some Christian, moral content. However, it keeps undercutting its positive dramatic points and contains too much politically correct revisionist history and foul language." @Ken - it's important to point out that The Butler is not a "Christian film", nor was it made by Christians, per se. The fact that a Biola alumnus was able to work on it in such a capacity at all is a blessing.